Six months ago, when I got off the plane in Argentina, I had no idea what to expect, not to mention no idea where to go. My first observation of this country was that they don’t have signs… anywhere! I follow the other passengers on my plane to the long migrations line. It isn’t until ten minutes in that I realize the smallest sign in the distance which reads (in both Spanish and English) “International Visitors.” Cool, I’m in the wrong line. I “perdón” my way out of the line for Argentine citizens and over to the much longer correct line. The whole time, I worry about speaking with the migrations officer and hoping all my luggage got through the two flight, 15-hour travel day. “Passaporte?” Ahh ok, I’ve got this. I hand the guy my passport. “¿Dónde vas a quedarte?” “Ummm…” ¿¡Dónde vas a quedarte, vos! ?” Ahhh…vos?…what? 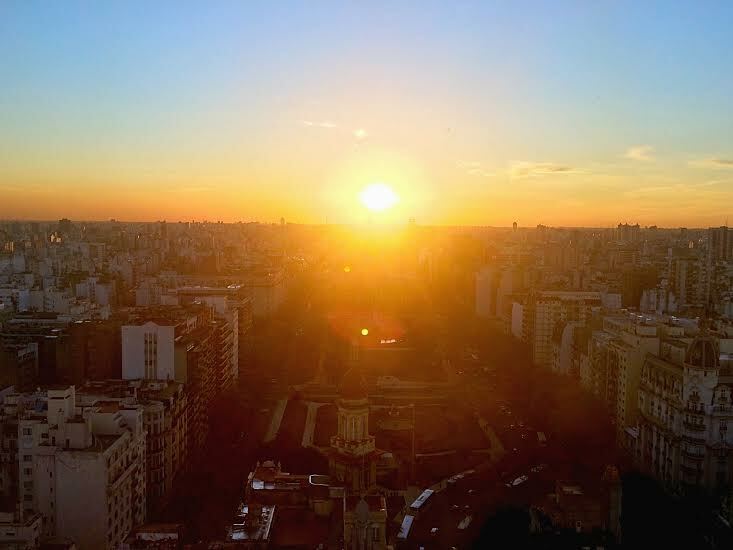 “Where you stay in Buenos Aires?” From this moment, I knew my time here would challenge me. Truly, every day in South America posed a struggle of varying size. Whether waiting 45 minutes for the bus, being ripped off by a cab driver or getting a mild bout of heatstroke, every day was an adventure, an adventure that I loved in its entirety. Argentina and I may have gotten off on the wrong foot but I can’t help but remember this experience as anything less than amazing. The friends I made during this trip will be some of my best friends for the rest of my life. I will always flock to whatever part of the U.S. my host family visits and I can’t wait to visit them back in Argentina someday! The places I traveled to in Argentina, Chile and Uruguay are bucket list items for many people. Coming home is the ultimate bittersweet feeling. I have learned to love Buenos Aires. I am finally comfortable traveling around the city, speaking the language, and being far from home. The summertime weather is in full force and I love it. All that being said, I am excited to go home. I missed the beauty of falling leaves and am excited to catch up on some cold nights with coffee by the fire. I can’t wait to see my family and all of my friends. For almost six months, Buenos Aires has been my home, my host family has been my family and my friends have been (please excuse this eye-roll-worthy moment) my everything. Now that I’m going home, I hate to think that all will change. 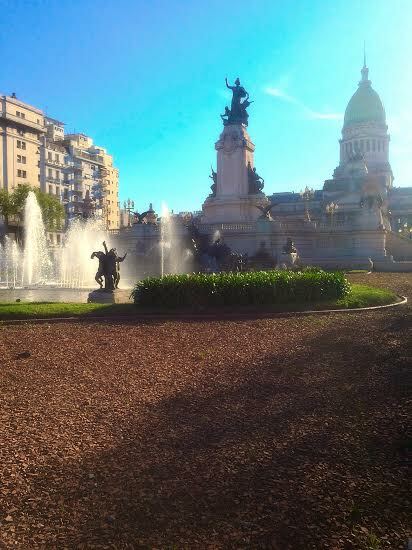 But in reality, I will return to Buenos Aires one day and feel at home as if nothing changed. I will stay in touch with my host family and see them again someday. And of course, I will see my friends back in Richmond come January. Coming home changes things a little but the way I look at it, I will always have these memories to hold on to this experience. I couldn’t have asked for a better time. I truly got to know my city, traveled around a little, made amazing friends and learned a lot about the culture, language and daily life in Argentina. I will always cherish this semester. To the city that had me tapping out many days but excitedly back in the ring the next, I bid you “adios.” To my beloved Buenos Aires, goodnight. Te amo. What do you know about Uruguay? For me, I knew absolutely nothing about this small coastal country. Its borders Argentina in the west, Brazil in the north and the Atlantic in the east and contains a little over 3 million citizens. With views like these, it is easy to believe that Uruguay ranks as one of the Latin American countries with the best quality of life. In Argentina we have Milagnesa sandwiches (thin, breaded steak and chicken) and in Uruguay they have Chivito sandwiches. This thin steak sandwich comes complete with ham, egg, olives and mayonnaise. It was so good I had it three times during our four day trip. My traveling companions this trip were Lauren and Sam, my University Torcuatu di Tella crew. Here we’re standing on Brava Beach in the Hand of Punta del Este. The fingers emerging from the sand are supposed to represent a drowning man. The artist wanted to use his sculpture as a warning to beach goers of the danger of the area’s large waves. Since 1982, this sculpture has been a huge tourist attraction and a staple Instagram picture for tourists. As the semester winds down, I decided to write a Bucket List of things to do before I leave…in less than three weeks! This weekend, after the election of conservative presidential candidate Mauricio Macri, I went to the Obelisk where supporters were celebrating. With the backdrop of a cloudy Buenos Aires night, you can see the Macri flyers falling like snow to the ground. As we were leaving, public works employees began leaf-blowing the flyers and other litter into trash bags. Seeing the Obelisk up close was on my Bucket List and getting to check it off this night was really special. Also on Sunday night, I went out to dinner with my friend Ben’s family in Puerto Madero (now checked off my to-do list). At the end of dinner and after the long election day, fireworks lit up over the river to celebrate Macri’s victory. On the other side from the fireworks is the famous Puente de la Mujer. This bridge’s name translates to “Woman’s Bridge” and represents the woman’s role in the tango with her leg extended from her body. In this picture you can see the “new” in Puerto Madero with its big apartment buildings and riverside dining but also the “old” as a still functional port. The Rosedal Park is one of the most beautiful gardens I have ever seen. Filled with roses of all different colors, this park has parrots (which are native to the area) flying all over the place. When I went to (as they say) take a moment to smell the roses, newlyweds were taking pictures and gardeners were working to maintain this amazing park. The National Museum of Fine Arts in Buenos Aires was amazing…and free! With works of important Argentine artists as well as famous international artists, the museum holds a little of everything. On the top floor, a contemporary art exhibit displayed some Argentine modern art, very distinct from the rest of the museum which is filled with immense tapestries, Rodin sculptures and Monet samples. It’s no Westhampton Lake, but it’ll do. This small lake in the middle of Buenos Aires has geese, ducks and other fauna, is just about the same size as Westhampton, and, on a nice day you, can roller-blade and bike-ride around it. The only real differences are the tall palm trees surrounding it and, of course, it’s hemispherical difference. This is my morning coffee view. Now that it’s so nice out, every morning, I drink my cup of coffee on the balcony and listen to the hustle and bustle of the city. Walking to a bus stop the other day in a part of the city I don’t often go, I passed this great little park where everyone was enjoying the sun and the nice summer climate. Parks like these are common all around Buenos Aires and I love stumbling across them. The word “porteño” is what you call someone from Buenos Aires. As the weeks and months pass, I am feeling more and more like a true porteño. 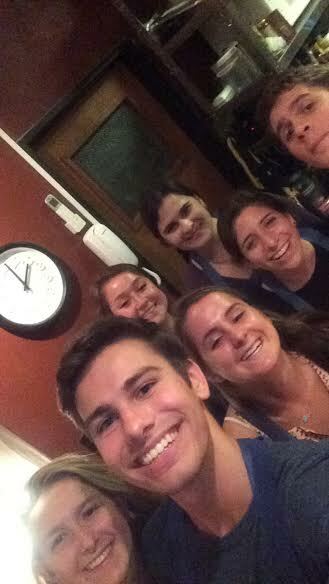 Recently, a bunch of my friends and I took a cooking class on traditional Argentine foods. We made empanadas, beef stew and a dulce de leche desert. It was one of the best meals I’ve had here! And it tasted even better knowing I had kneaded the dough and stirred the stew. This, among others, was a cultural experience for which UR reimbursed the cost. 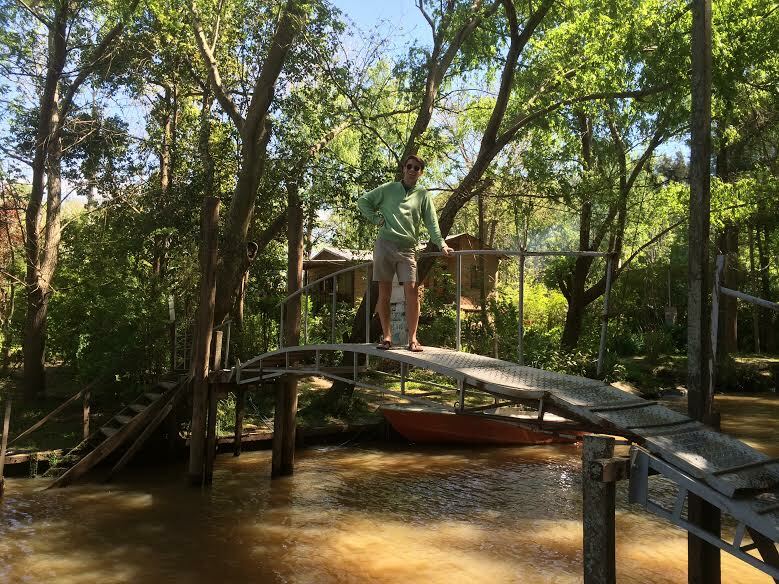 Also like a true porteño, I recently took a day trip to Delta del Tigre, a small residential town north of the city, in the province of Buenos Aires. This area is made up of a bunch of islands separated by narrow canals, streams and rivers. You can take boat taxis to different islands, have a picnic and just relax. Here’s a picture of me being awkward on a small bridge connecting two close islands. I, being my true porteño self, also experienced the beauty of an Argentine asado recently. 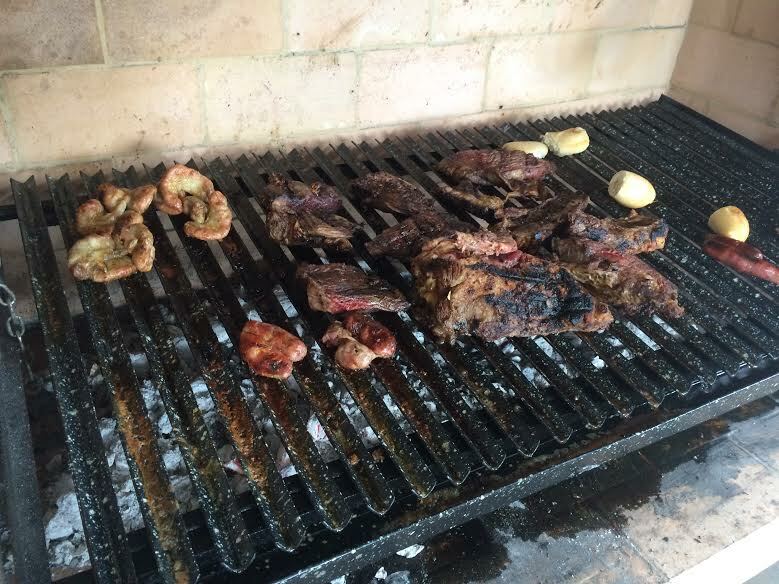 An asado is the equivalent of the American cookout. My host family invited me to their first asado of the summer. As meat cooked on the huge grill, a fragrant smoke filled the room! Along with regular steaks and chorizo sausages, I tried (and subsequently did not enjoy) cow intestines and blood pudding… but of course, as a porteño, I had to try. To my Auntie Donna, who always jokes there’s no way I go to classes because I have so much fun abroad, here’s proof on the contrary. Well, I guess all this proves is that I’ve stood in front of the school… but trust me, I’ve entered the building as well. 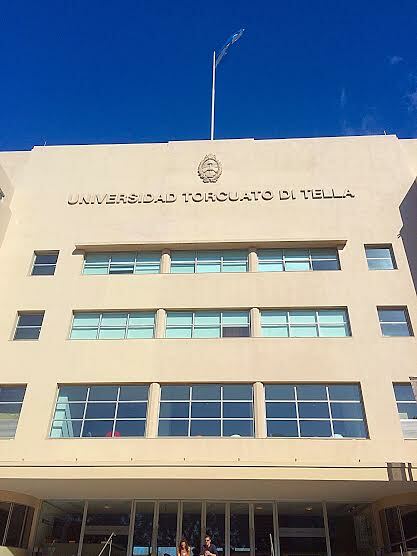 The University Torcuato di Tella was founded in 1991 and recently moved to this building in March 2013. The very modern building with cement floors and big glass doors and windows stays (aesthetically) true to its industrial roots as an automobile factory. 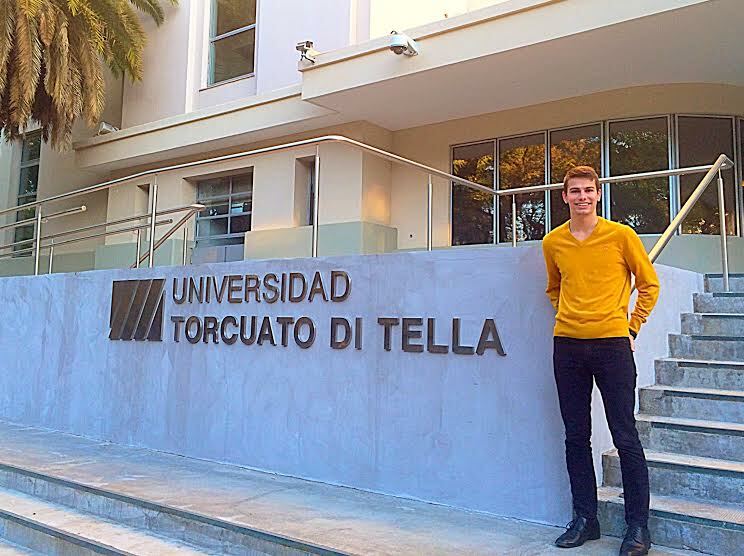 Di Tella, as students commonly shorten the University’s name, is known for its business and architecture programs. All located under the roof of one main building, other programs of study include political science, law, history and international studies. The school has about 1,200 undergraduate students. I, along with the other Richmond students here, am in direct exchange with di Tella and UR which means students from Buenos Aires are currently in Virginia studying on our campus. This is what almost every classroom at di Tella looks like: very simple with concrete floors, white tables, white walls, a projection screen and one of those cool sliding whiteboard things. 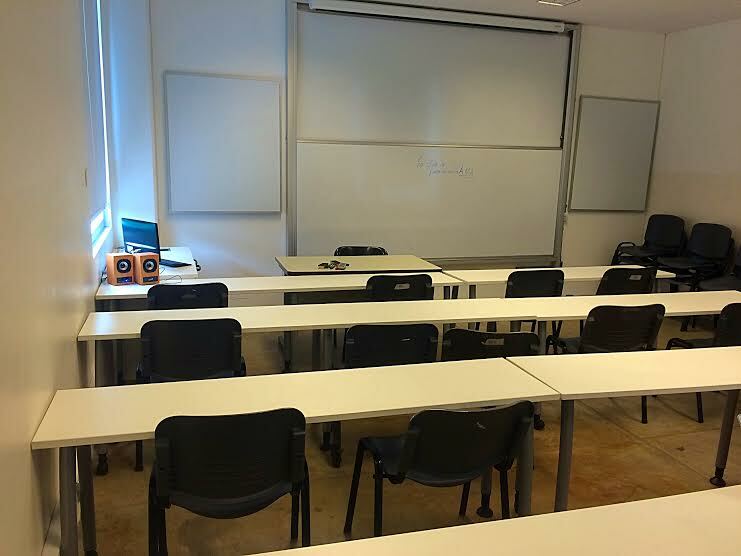 This is the room in which I have my Argentine Literature class. I am also taking a Latin American Cinema course and a class called Dictatorships and Militancy in the Southern Cone (Argentina, Chile and Uruguay) During the 1960’s and 70’s. I have enjoyed all of them so far. Getting ready for class today, I decided to have a little photoshoot. These are the materials I have for my Dictatorships class. 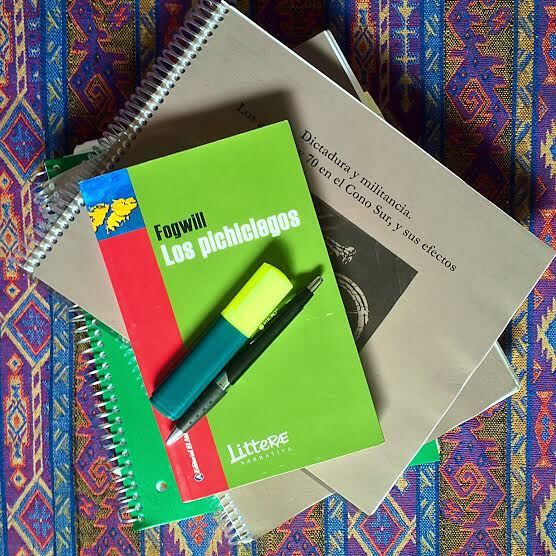 We recently read the popular Rodolfo Fogwill novel “Los Pichiciegos.” It is about a fictional group of Argentine military deserters during the Malvinas War, better known as the Falkland Islands War, between Argentina and the United Kingdom in 1983. Although a good read, I enjoy our other readings more which regard the history and the current memory of the topic. It is interesting to study how history is presented and how people remember these negative and sometimes traumatic events. The day after the Supermoon, I saw an farcical article about how people’s photos from the night before were blurry and underwhelming. While most of mine can be described equally, I think this one is pretty cool. 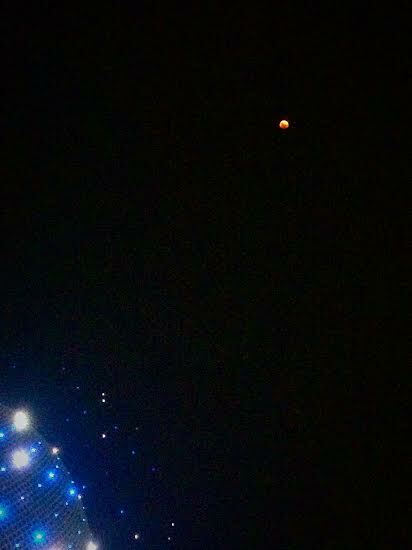 I went to the Planetarium in Buenos Aires with a couple of my friends to see this rare moon. With live music, a big projection of the moon up close, and about 15,000 other people, we had a really amazing experience we’ll be able to reminisce about in 2033. On top of Palacio Borolo, an office building designed and built during the early 20th century and inspired by Dante’s “Divine Comedy,” lie some of the greatest views of Buenos Aires. From the top lighthouse, you can see the famous Eva Peron mural, the Obelisk, and the Congress building (see next photo). A 6 pm tour of the palace gets you to the top perfectly as the sun is setting over the city. While the view of the Congreso is cool from the top of Palacio Borolo, the ground view is nice too. Once, while driving past the Plaza de Congreso and admiring its beauty, my cab driver agreed that, yes, it is nice on the outside, but remarked that what happens on the inside is not always so pretty. Yikes! 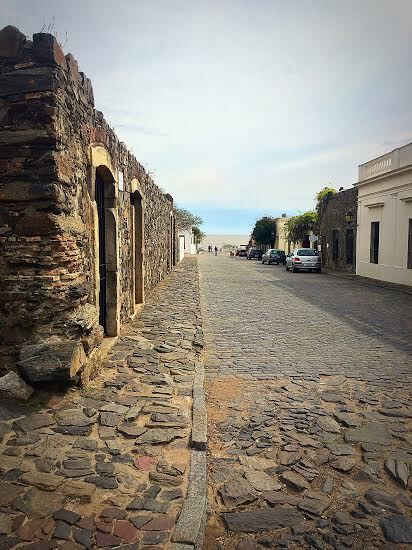 A day trip to Colonia, Uruguay is a must for any extranjero in Buenos Aires. An hour ferry ride to the opposite shore of el Rio de la Plata brings you to the gorgeous Spanish colonial town where alley ways with river views like this are the norm. A nice lunch and an excursion to a typical, quaint, Latin American church is basically all the town has to offer, but it is a great change from the hustle and bustle of the streets of Buenos Aires. Back in Argentina, I have finally made it to a soccer game! 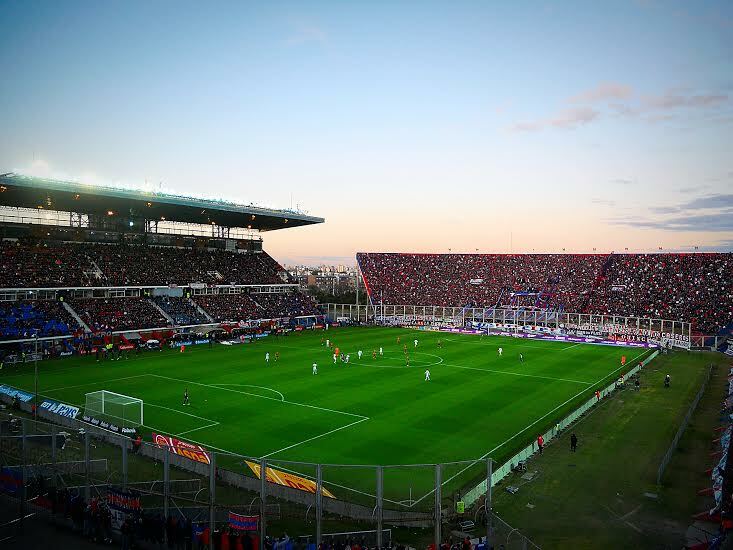 On a brisk Saturday night, San Lorenzo hosted Rosario for an overtime game that ended in a 2-2 tie. The stadium was packed with the most dedicated fans I have ever seen…or heard. Throughout the entire 2 hours or so, the fans sang on the top of their lungs. Truly, the simple, alcohol-free stadium, even without a scoreboard, fills with Spanish rhythms and rhymes for the entirety of the game, creating a contagious energy I’ll never forget. My dad joked that it was obvious a vocal audition wasn’t required before being permitted entrance.